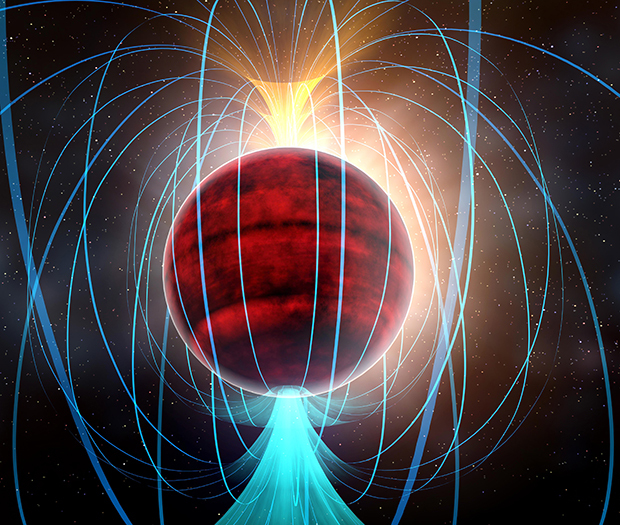 An artist’s impression of the red dwarf TVLM 513-46546, which sports an intense magnetic field (indicated by the blue field lines) that triggers powerful solar flares. Image: NRAO/AUI/NSF/Dana Berry/Skyworks. Like other stars the red dwarf, named TVLM 513-46546, has a magnetic field, but the intensity of this field for such a small star has proven to be astounding. When magnetic field lines emerging from the star’s visible ‘surface’ snap and then reconnect, they release a torrent of powerful energy in the form of X-rays, ultraviolet light and electrons. The high-energy electrons speed around the star’s magnetic field lines and as they do so, they release radio waves. The stronger the magnetic field, the more energetic the radio waves. These radio waves travelled through space for 35 years before reaching ALMA, the giant Atacama Large Millimetre/submillimetre Array of radio telescopes in Chile. The data ALMA collected showed that these were the highest frequency radio signals ever measured coming from a red dwarf. The measured frequency of 95 GHz indicates that the average magnetic field strength on TVLM 513 is thousands of gauss. The gauss is a unit of measurement of magnetic field strength and, for comparison, the Sun’s average magnetic field measures a mere one gauss, with only its most active regions reaching levels of thousands of gauss. In a sense, TVLM 513’s entire surface is equivalent to one giant active region on the Sun. Why such a diminutive star should be so magnetically powerful is a mystery, but there are clues in its unusual characteristics. For instance, it spins incredibly fast, making one rotation in just two hours. Compare this with the Sun, which takes twenty-four-and-a-half days to rotate at the solar equator. 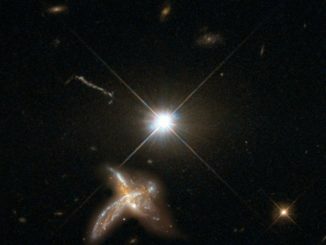 The fast rotation indicates that TVLM 513 is likely a young star, but exactly how young is uncertain – estimates range from anywhere between a hundred million years to half a billion years or so. This fits with observations indicating that young stars, particularly red dwarfs, can be much more active than their older brethren. 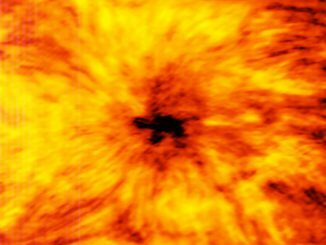 “In general, the relationship between activity and age in Sun-like stars is intimately tied to rotation,” Williams tells Astronomy Now. For example the Sun, which is now 4.6 billion years old, sheds angular momentum in the energy of its solar wind, causing its rotation to slow. Red dwarfs like TVLM 513 are at a disadvantage in this regard because their stellar winds are less powerful than the Sun’s, so they do not lose angular momentum as quickly and hence continue their fast rotation. Exactly how a star’s rotation is related to the magnetic dynamo deep within its interior is still unclear, says Williams. In the Sun the dynamo is thought to be generated at the boundary between the convective layer and the inner radiative zone, but the details are sketchy. “A very low-mass object such as TVLM 513 does not have a Sun-like dynamo, however, and a big question is how the relationship between rotation and driving of the magnetic dynamo operates inside a red dwarf,” says Williams, who suggests that the fast rotation “almost surely” has an effect. Another oddity is TVLM 513’s low mass, which places it just above the boundary between being a genuine star and a brown dwarf, which is an object not massive enough to ignite the nuclear fusion of hydrogen within its core to generate energy. However, Williams notes similarities between TVLM 513 and some ‘failed star’ brown dwarfs, citing the similarly strong magnetic field observed within a very cool brown dwarf called 2MASS 1047+21. However, the flares that TVLM 513 experiences have never been observed on a brown dwarf. “My hunch is that brown dwarfs do not have these kinds of flares, but cool, low mass red dwarfs like TVLM 513 seem to occupy some kind of transitional regime where they have largely stable magnetic fields but big flares too,” says Williams. The findings have a greater importance in a wider context. Earlier this week a study published in the Monthly Notices of the Royal Astronomical Society indicated that the Earth-sized world orbiting a red dwarf named Kepler-438 was likely being irradiated by flares from the star that would strip away its atmosphere (see our earlier story). Although no planets have yet been confirmed to orbit TVLM 513, would such stormy magnetic activity render planets around red dwarfs uninhabitable? 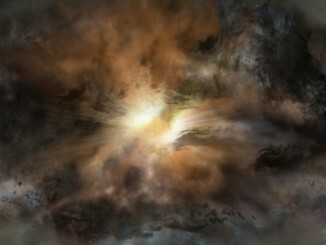 Astronomers have discovered a new kind of galaxy in the early universe, less than a billion years after the Big Bang. These galaxies are forming stars more than a hundred times faster than our own Milky Way. The discovery could explain an earlier finding: a population of surprisingly massive galaxies at a time 1.5 billion years after the Big Bang, which would require such hyper-productive precursors to grow their hundreds of billions of stars.